* The author would like to thank the Conselho Nacional de Desenvolvimento Científico e Tecnológico (CNPq) and the Fundação de Empreendimentos Científicos e Tecnológicos (Finatec) for financial support. He would also like to thank Carlos Pereira, David Samuels and Eduardo Leoni for data, ideas and support. ** Professor adjunto, Centro de Pesquisas e Pós-Graduação sobre as Américas, Universidade de Brasília, Brazil. luciorenno@unb.br. Corruption was a central theme of the Brazilian 2006 elections, both at the Executive and Legislative levels. According to our data, more than 100 Federal Deputies, or 1 in 5 in the 52nd Legislature (2003-2007) were mentioned by the media in relation to some scandal. The focus of this paper is how Federal Deputies involved in corruption scandals fare during elections. Do voters punish allegedly corrupt politicians? We use a dataset of Brazilian Federal Deputies legislative and electoral performance to test how involvement in corruption is related to career choice and reelection success in the 2006 elections. La corrupción fue un tema central de las elecciones brasileñas del 2006, tanto en la rama Ejecutiva como en la Legislativa. Según nuestros datos, más de cien del los Delegados Federales, o un quinto de la quincuagésima segunda Sesión Legislativa (2003-2007), fueron relacionados por los medios con algún escándalo. Este artículo se enfoca en cómo es la suerte de los Delegados Federales involucrados en escándalos de corrupción. ¿Acaso los votantes castigan a los políticos supuestamente corruptos? Utilizamos un conjunto de datos acerca del desempeño legislativo y electoral de los Delegados Federales Brasileños para estudiar cómo el estar involucrado en corrupción se relaciona con decisiones de carrera y con el éxito en ser reelegidos. Palabras Clave:reelección, carreras legislativas, corrupción. Corruption was a central theme of the Brazilian 2006 elections, both at the Executive and Legislative levels. Early in their time in office, which started in 2003, both powers were plagued by extremely serious accusations of bribery, use of undisclosed funds for campaign expenditures, passive and active corruption, amongst others. An initial scandal, dubbed the Mensalao or Big Monthly Stipend, involved accusations of the distribution of undisclosed funds, left over from campaign contributions to Deputies in exchange for support of Executive Branch’ legislative proposals. Another major scandal soon emerged, known as Sanguessugas or Bloodsuckers’ Scandal, which involved a scheme that allocated Deputy’s individual budgetary amendments for the purchase of overpriced ambulances in exchange for bribes. In exchange for the transfer of budgetary funds to purchase ambulances from specific firms, deputies received a percentage of the total value as a kickback. According to our data, 115 Deputies, one in five of the 52nd Legislature, had their names mentioned in the media in connection with some scandal.1 The focus of this paper is, therefore, to investigate how politicians who had their names mentioned by the media in relation to corruption scandals fare in the 2006 elections. In fact, thirty-three Federal Deputies were judged by their peers in the Ethics Committee of the Chamber of Deputies. Fifteen were found guilty, forcing the floor to vote on their expulsion. However, the Chamber punished very few of those involved. All in all, eight Deputies were removed from office during the period of 2003 to 2007, for various reasons. Only three of those removals were directly related to the Mensalao Scandal. Another eight resigned before the investigation process ended to avoid sanctions and to protect their eligibility for the 2006 elections. Those who resigned insisted that voters would make the real judgment. From this perspective, voters are the only legitimate judges of political action. This brings a key aspect of democratic governance, and political science research, to the forefront: what are the determinant factors for reelection and how do incumbents mold their electoral strategies to win elections? Do voters punish incompetent and dishonest politicians? This research note attempts to address these questions, specifically whether voters punish allegedly corrupt politicians or not. According to Przeworski et al. (2000), accountability refers to the voters’ ability to penalize representatives for wrongdoing during their time in office. Involvement in corrupt behavior is certainly an indication of potential opportunistic tendencies and if voters do hold their representatives accountable,then they should punish representatives involved in corruption. Even if the corruption allegations are not proven, the attention caused by the supposedly corrupt actions should have a strong negative effect in electoral success. Was this the case in the Brazilian 2006 Legislative Elections? Brazil’s 2006 elections provide an excellent opportunity to study the impact of corruption in legislative elections given the widespread occurrence of scandals in the 52nd Legislature. However, the relationship between corruption and elections is not exclusively Brazilian. Corruption scandals are also rampant in many other countries (Pérez-Liñán 2004). Therefore, the empirical analysis of the Brazilian case can provide lessons that could be applied elsewhere. In the following sections we will advance a theoretical model regarding how involvement in corruption scandals can influence electoral success and the campaign strategies of Federal Deputies. Scandal involvement is certainly a factor that decisively influences the electoral chances of incumbent Deputies. It does so directly in elections, by reducing the likelihood of victory. But, it also impacts elections indirectly, by affecting incumbents’ campaign strategies. Federal Deputies involved in scandals will spend more money in their campaigns and will promote more budgetary amendments. There is no guarantee that such strategies will result in electoral victory, but those who engage in them increase their likelihood of reelection, in spite of being involved in scandals. Following the theoretical discussion, in which we empirically derive verifiable hypotheses, we test these hypotheses using our unique dataset. In the last section we offer a summary of the findings and discuss their implications. Our model is based on the idea that voters use distinct criteria to evaluate their representatives (Stokes 2001). Such criteria, at times, may be contradictory, leading to ambiguity and tradeoffs. For instance, voters may evaluate their representatives based on an intertemporal approach, in which the future weights more heavily in the vote decision than the past. Or, a voter can be purely retrospective and punish or reward incumbents according to their performance in office. Additionally, voters do not come to elections with a blank slate.There are pre-existing loyalties to specific candidates that influence vote choice. Hence, voters may consider the distinct actions of Federal Deputies differently based on their prior loyalties to the Deputies and their expectations of future returns by continuing to support the , even if the is involved in scandals. That is to say that voters use shortcuts in their decision making process, where certain attributes of a candidate are given more importance, at the expense of others. Shortcuts or long-term attachments can solve problems of ambiguity. Still, scandal involvement can cast a shadow on a Deputy’s reputation, and hurt the long-term loyalties held with voters. Deputies involved in scandals, then, may tailor their campaign strategy and rhetoric as well as their performance in Congress accordingly. They try to highlight his/her achievements and minimize criticism. Federal Deputies involved in scandals may have to work harder to regain voters’ confidence. In Brazil, this translates into two main strategies: involvement in pork barrel politics and increase in campaign spending. In order to understand representative-voters relationship, especially from the representative’s viewpoint, it is fundamental to investigate the determining factors for electoral success. The question then is what are the factors that influence electoral success of Federal Deputies in Brazil? In other words, issues benefitting the voters at the local level are very significant in explaining electoral success. Such findings have been used to argue that voters hold their representatives accountable, but only for issues concerning their specific localities. Hence, we argue that politicians are held accountable for their actions, but only at the local level (Pereira and Renno 2003). What happens when another element is introduced into the equation, such as involvement in corruption scandals? Does a Deputy’s performance at the local level protect him against corruption accusations? There are few studies that focus on how politicians involved in corruption scandals react while attempting to survive politically. The transparency of the political system and voters’ attentiveness are central factors of the political impact of corruption. Even when voters are aware of accusations of the representatives’ involvement in scandals, which is not always the case, prior loyalties between voter and representative may protect the Federal Deputy from being punished. In voting behavior literature, such loyalties are referred to as long term factors influencing voter’s choice. In more consolidated political systems, party membership is the most studied longterm factor. Even though in young democracies party membership levels may be lower, long-term loyalties may be due to a plethora of other factors, such as prior distribution of pork barrel projects or personal favors, expectations of continuation of such favoritism in the future, family or friendship ties with the representative, loyalty to members of the local network that supports the representative, or even ideology. On the other hand, involvement in corruption scandals may cause voters to become ambivalent regarding long-term loyalties.Voters placed in this situation are no longer in the comfortable position of relying exclusively in one factor to make a voting decision. There is a trade-off between long-term commitments and the new information brought to scene by the corruption scandal. The question is, then, how do voters react? Our argument is that the actions of Deputies, both in the past as well as the present, will have a clear effect in their electoral chances and in increasing their imperviousness to scandal. Hence, to understand the connection between voter and representatives involved in corruption scandals, we have to investigate the actions of the representative regarding factors that may strengthen the long-term loyalties of voters. In other words, incumbents who are successful in highlighting their constituents long-term commitments and expectations of continued future rewards, will aid voters in solving their electoral dilemma. Furthermore, there are two conditioning factors that must be taken into account, which could explain the electoral success of corrupt politicians. First, the levels of competition at the local level must be taken into account. Where there is more competition, there is more information available and increased campaign awareness. Hence, competition could bring to the foreground short-term campaign factors such as involvement in corruption. 1) Pork Barrel politics should encourage running for reelection and positively influence the chances for reelection success, especially for politicians involved in scandals. 2) Campaign finance should encourage running for reelection and positively influence the chances for reelection success, especially for politicians involved in scandals. 3) Politicians involved in scandals will not be deterred from running for reelection. They believe that voters are not paying attention or that they will be able to justify their actions. 4) Politicians involved in scandals will be more likely to be punished in elections than those who aren’t. The data was collected through archival research focusing on the allocation of individual budgetary amendments (pork barrel politics),performance inside Congress, campaign expenditures, electoral competition and scandal traits. The data was obtained mostly in the Chamber of Deputies, The Superior Electoral Court and media outlets such as Veja magazine and Folha de Sao Paulo newspaper. In 2006, a record-breaking number of 73% of the Federal Deputies ran for reelection. Clearly, there was a wide-spread belief among representatives that voters would be as lenient as their peers were in passing judgment. However, of these, 61% were reelected, a downturn from the recent pattern. Of the 115 Federal Deputies involved in scandals, 71 ran for reelection and 36 retired. Therefore, 62% of those involved with scandals attempted reelection and 30 were successful, 42% of those who ran. The success rate for incumbents who had their name mentioned by the media in relation to some scandal was much lower than the average for the entire population. It was even lower when compared to Deputies who were not involved in scandals. Of those who were not involved in scandals, 385, or 75% ran for reelection. 65% of them were reelected. The comparison between these simple descriptive statistics delivers a very clear and powerful message: Corrupt politicians were punished. What caused such variation? Why were some allegedly corrupt politicians rewarded and others punished? Below we test our initial six hypotheses about the impact of involvement in corruption on electoral success. First, we test if involvement in corruption influences the decision to for reelection or not. Second, we focus on the federal deputies’ electoral success. Finally, we contrast the electoral strategies of only the politicians involved in scandals. This last test allows us to verify if the significance, direction and magnitude of the coefficients vary between the distinct groups analyzed, which is a form of testing for causal heterogeneity. Scandal - Dummy variable indicating Federal Deputies involved in scandals. It tests hypotheses three and four. Budgetary Amendments - Incumbents’ four-year mean of the percentage of annual budgetary amendments promoted. This variable is centered on the state’s mean. It tests hypothesis one. Campaign Expenditures - Incumbents’ deviation from the multi-nominal district mean value of expenditures in reais. This variable was centered on the state’s mean. Vote 2002 - Total votes the incumbent received in the previous election. This variable was centered on the state’s mean. It tests hypothesis two. Number of Candidates by Seat - Variable indicating the number of candidates that competed for the seat in each electoral district. Used here as a proxy for electoral competition, an important control variable. Legislative Performance - Count of all activities undertaken by the Federal Congressman in Congress during their tenure, including number of projects. This variable is a control for performance in Congress. Main Officeholder - Dummy variable indicating whether the Federal Deputy was elected as titular in 2002 or suplente in 2002. This variable is a control for the status of the Deputy inside Congress. Titulares rank higher on postelection party lists, which indicate that they are politicians with stronger political muscle. Member of Governing Coalition - Dummy variable indicating if the incumbent is from one of the parties in the governing coalition. Includes members of the PT, PMDB, PSB, PC DO B, PTB, PP AND PL. This is our final control variable and captures any impact of proximity to the central government in electoral success. Results confirm some hypotheses and reject others. Our first hypothesis is only partially confirmed. Distributing budgetary amendments only influences the choice to run for reelection, hence influencing career choice. It does not seem to have an electoral impact. The second hypothesis is confirmed: Campaign expenditures have a statistically significant impact on the electoral success of Federal Deputies. Hypothesis three, on the other hand, is completely disproven. Incumbents involved in scandals are deterred from running for reelection. On its turn, hypotheses four is completely accepted, scandal involvement has a strong negative impact in electoral success. These results clearly indicate that politicians associated with corruption scandals are punished in elections. Voters do seem to be paying attention. But not just that, deputies are aware that their electoral chances are lower when they are involved in scandals and simply do not run. When we contrast only deputies involved in scandals, the single variable that explains their electoral success is campaign finance.Therefore, the cost of winning reelection is higher for those who are involved in scandals. It is interesting to mention that running for reelection amongst those involved in scandals is also increased by the fact of the deputy being a member of a party in the governing coalition. Deputies from such parties feel more inclined to run. Even though many allegedly corrupt politicians ran for reelection, imagining that voters were not paying attention, only a minority of them were successful in the campaign. 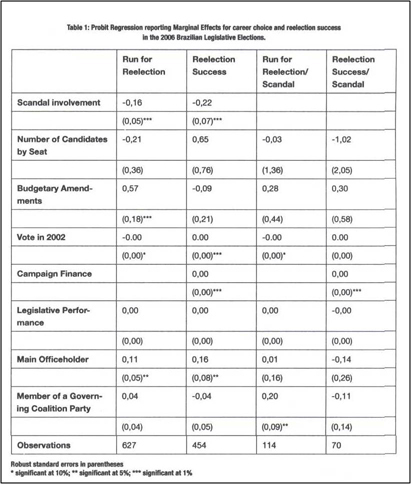 In addition, politicians who were not involved in scandals were much more likely to win reelection. This is a sign that voters are not completely aloof of what politicians do and punish the ones who engage in corruption. Still, campaign expenditure is an important shield for incumbents involved in scandals: It is the only factor that explains electoral success among Deputies linked to scandals. In this sense, reforms that aim at reducing the impact money has on elections may also contribute to increase the already significant probability that involvement in corruption scandals will not be forgiven by voters. Evidence provided here counters the conventional wisdom that impunity is prevalent in Brazil. What remains to be seen is if these findings are particular to the 2006 elections or are a stable trait of Brazilian politics. 1 Research assistants conducted an extensive survey of the online archives of the Folha de Sao Paulo newspaper and the Veja magazine, two of the most important media outlets covering Brazilian politics. I would like to thank Heloisa Bessa,Vitor Santana, Rodrigo Molina and Felipe Assis for their assistance. 2 For a competing view, see Figueiredo and Limongi 1999.